All Saturday daytime events for children and adults will be held at the Exeter Town Hall, Exeter Public Library, Water Street Bookstore and A Picture's Worth a Thousand Words bookshop. Tickets are $10 and $5 Child/Senior, see full information and RSVP via TEAM's facebook page. All Saturday daytime events are free and open to the public. 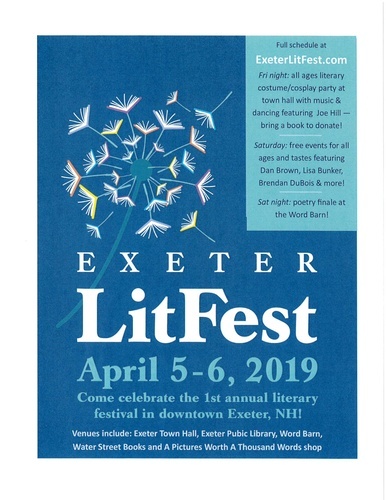 On April 5 and 6, 2019 Exeter will hold its first literary festival - "Exeter LitFest." This event celebrates the diversity of Exeter writers, both past and present. The program opens Friday night with an all ages literary costume/cosplay party in the Exeter Town Hall featuring author and comic book writer Joe Hill, presented in conjunction with TEAM (Team/Exeter/Arts/Music) as part of their ongoing downtown "First Friday" cultural series. There will be music, dancing, prizes and a book drive.